Goodnight, Ark is a short illustrated children’s book from ZonderKidz. 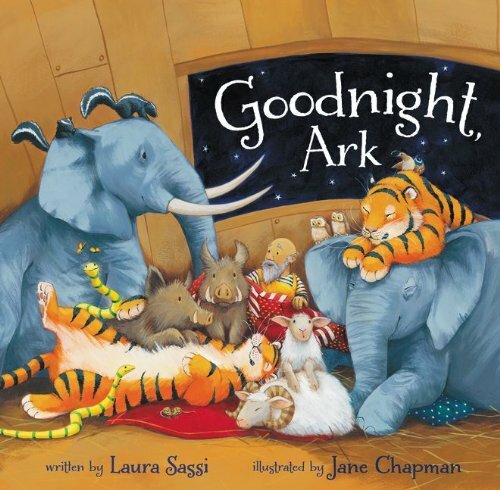 Through rhyming verse and illustrations by Jane Chapman, Goodnight, Ark tells the story of a night on the ark and the tumultuous consequences of too many animals in Noah’s bed. Though meant for children 4-8 our oldest absolutely loved the story and illustrations laughing at many of the funny depictions. Upon our first reading she decided she wanted to “read it to herself” and mimicked the animal noises and crashing conclusion. Goodnight, Ark definitely passed the kiddo test. From an adult perspective, Goodnight, Ark does have some pretty good illustrations. The tone of Chapman’s work goes well with the funny nature of Sassi’s rhymes. The inclusion of animal sounds does hinder the smoothness of rhyming but makes Goodnight, Ark entertaining. The main story is clearly not Biblical. A night on the ark in the midst of a devastating flood might not seem like an ideal bedtime story. Parents should remember to distinguish this from the Biblical count and not have a haughty spirit towards this fun children’s book. In conclusion, though set against the backdrop of a dramatic Biblical account, Goodnight, Ark is a fun bedtime story for both children and adults. Disclosure of Material Connection: I received this book free from the publisher. I was not required to write a positive review. The opinions I have expressed are my own. I am disclosing this in accordance with the Federal Trade Commission's 16 CFR, Part 255: "Guides Concerning the Use of Endorsements and Testimonials in Advertising."